Just finished my morning chores and I believe by writing early I’ll catch an earlier mail, but of course this won’t help only I know that your mail will be “bunchy.” So I hope you don’t worry about not getting letters for a few days. It’s just the way things happen. I’ve been amusing myself at off times reading Agatha Christie’s book “Murder in The Air.” It’s a pretty good murder story but my reading time is cut in small pieces. [page 2] Steak – apple with ice cream – corn mashed potatoes, green beans and I almost forgot soup to begin and raisin bread. The bread wasn’t very necessary for me however. Yes I’m in my right mind that is exactly what we had and yes Iced tea with a shot of fresh limes. We do not have things like this every day but we appreciate it when it comes along you can bet. There has been some delay due to a little argument about things in general and it’s still is going on but I’m turning a deaf ear to things. 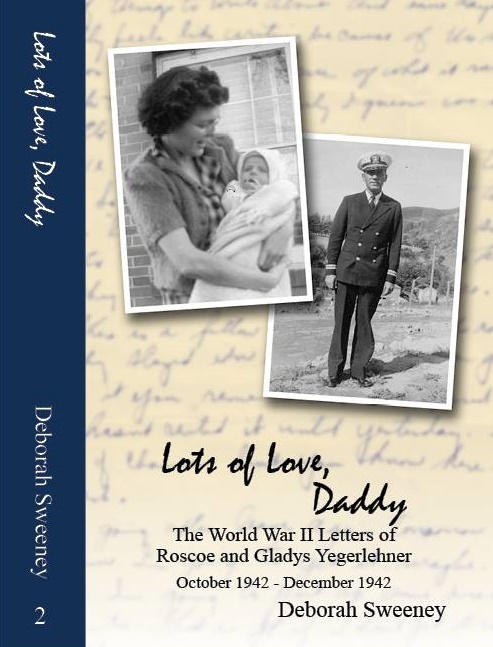 This entry was posted in Foster, Genealogy, World War II, World War II Letters, Yegerlehner and tagged Agatha Christie, Death in the Clouds, Gladys R. (Foster) Yegerlehner, Guadalcanal, Murder in the Air, Navy 224, Roscoe S. Yegerlehner, Russell Islands, Solomon Islands, World War II, World War II letters on April 9, 2014 by Deborah Sweeney. “Death in the Air” is one of her Hercule Poirot novels. We saw the David Suchet version of it. Sounds like a feast to me!